Big Summer Solstice Party, JUNE 15th! This coming Wednesday! 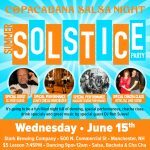 Salsa party of the Summer in New Hampshire at Copacabana Salsa Night. We have a special night planned for you all. It starts with a ChaCha Workshop from 6:45-7:45pm so plan to get there early. Following the Cha Cha Workshop will be or weekly Salsa lessons with two levels, a beginner for those who are new to salsa, and an intermediate level for those that know the basics of salsa and are looking to improve their skills and learn new combos. Salsa Lessons run 7:45-9pm. Then the dancing starts! Social Dancing from 9pm till midnight to celebrate the long summer days! We will have performances by Manchester’s own Leah’s Chicas as well as Boston’s 2016 Masacote Student Team! Also we will have for this one night only, one of Boston’s best most renown Salsa DJ’s in the house, DJ Rob Suave! Dancing will go to Midnight, and the music will be fantastic! Be sure to plan to go in to work late on Thursday morning. 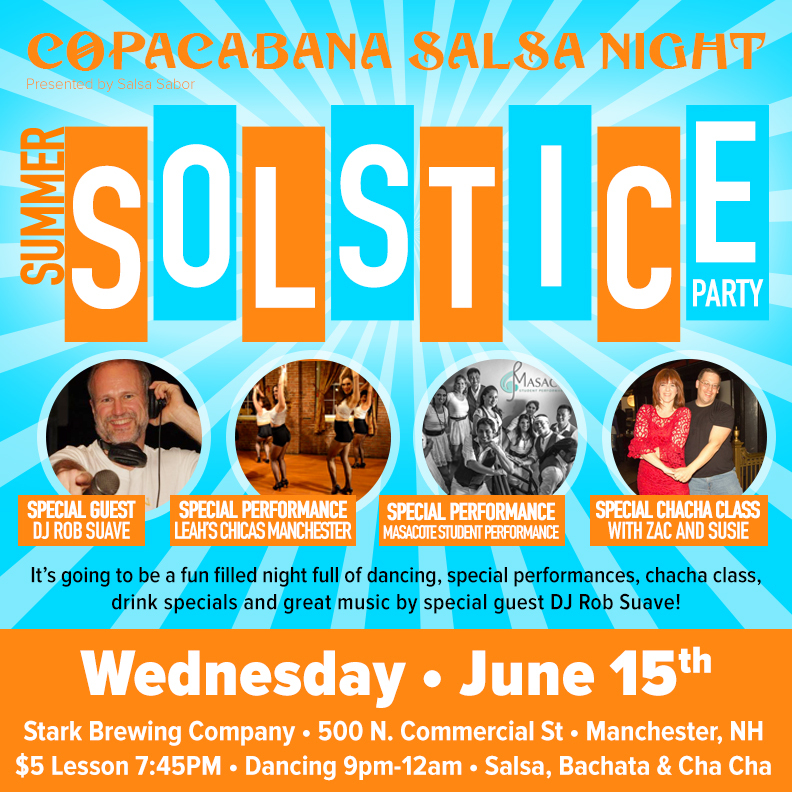 Copacabana Salsa Wednesdays take place each and every week at Stark Brewing Co. (formerly Milly’s Tavern) 500N Commercial St Manchester, NH. Always fun, friendly and welcoming. No experience necessary. No partner required. Come have fun and learn to dance with us.